We understand how tricky it can be to choose the perfect motorhome that will suit you and your needs. To make the decision process easier for you we have given the facts relating to each Motorhome Company and what you can expect. With a large and dependable rental fleet Maui are firmly positioned in the top end of the market. Their high standard vehicles are expertly maintained, well laid out living areas, comfortable sleeping arrangements and all come equipped with automatic transmission. The 6 berth Platinum is the most luxuriously equipped, boasting a GPS Navigation unit and flat screen TV with a DVD player. Maui will reimburse your taxi fare from the airport to your pick up branch, and they do not charge for additional drivers or for linen. 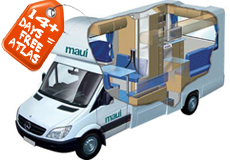 Britz campervans were initially Maui Campervans and offer the perfect balance between price and comfort. They are expertly maintained, comfortable and offer great value for your money. The availability of Britz Campervans is excellent due to their large fleet, while their affordable pricing makes them a great choice for the budget conscious traveller who still values comfort. Jucy is a dynamic and friendly hire company which aims to provide 'the best deals on wheels' from Auckland to Queenstown. Jucy campers are custom built and perfectly suited to younger travellers, as any fully licenced driver over 18 can hire one. These vibrant vehicles are brand new models, and your Jucy rental rate includes unlimited kilometres, tax and 24hr roadside assistance. Going Mighty on Adventure! More awesome than the average cheap motorhome hire. Mighty campers are best suited for budget conscious travellers. While they do not have all the bells and whistles they are affordable, reliable and perfect for discovering New Zealand. All Mighty vehicles are expertly maintained and include 24 hour vehicle assistance. The smaller 2 berths are very popular and are a great way to enjoy a cost cutting holiday. With their huge fleet size, availability is very rarely a problem, and they have depots in all the main centers (Auckland, Christchurch, & Queenstown). Escape Campervans are a 100% Kiwi company who were established in 2003 with just 10 vehicles and now operate around 200 campers! Escape are Qualmark certified (New Zealand’s independent quality assurance agency). Escape are a company who offer a high level of service, commitment to low prices and uncomplicated rental terms. Escape operate only Toyota Hiace and Nissan Caravan campervans. These are rugged and dependable - Ideal for New Zealand driving conditions. Requests can be made for specific designs, however no guarantees can be made.